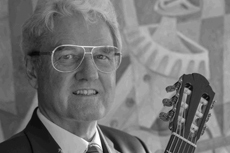 Matthias Seidel received his first guitar lessons in Stuttgart which was supplemented by regular seminars, among others with Karl Scheit.In 1969 he continued his studies in Salzburg with Prof. Barna Kovats and graduated with distinction in 1974. A lectureship for guitar at the Mozarteum, the organization of an active concert schedule, especially with chamber music in various ensembles, as well as the regular cooperation with the Salzburg Festival followed. 1980 Matthias Seidel was awarded Professor of Guitar and during the following years some well-known guitarists who enrich the guitar scene by their activity in concert life as well as in the educational field emerged from this class at the University Mozarteum. Master classes at home and abroad, acting as a juror at different competitions expand his educational working field. Due to extensive efforts to develop the supraregional music scene and through a strong affinity for administration he was appointed vice-chancellor of the University Mozarteum as of October 2014 after working many years there on the management level. Since 2000 Matthias Seidel is a founding member of the ensemble "tri(o)colore" and the "Duo Seidel". These ensembles follow many invitations to concerts at home and abroad as well as taking part in music events.